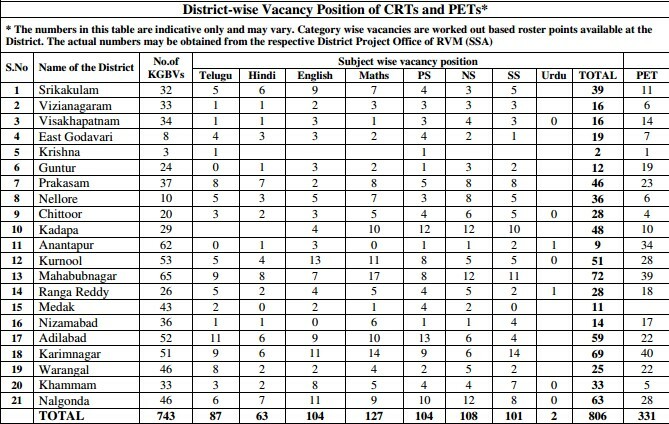 Applications are invited for preparation of District-wise panels with eligible female candidates to the posts of Contract Resident Teachers and PETs for filling up existing and future vacancies in the Kasturba Gandhi Balika Vidyalayas, which are Residential Schools for girls in classes 6 – 10 from eligible female candidates who hold the requisite qualifications and are residing in the same mandal HQ where the vacancies exist. Applications should be submitted in the District Project Offices, Rajiv Vidya Mission (SSA) of the concerned districts only. Adilabad-59, Anantapur-9, Chittor-28, East Godavari-19, Guntur-12, Kadapa-48, Karim Nagar-69, Khammam-33, krishna-2, Kurnool-51, Medak-11, Mehabubnagar-72, Nalgonda-63, Nellore-36, Nizamabad-14, Prakasam-46, Ranga Reddy-28, Srikakulam-39, Vishakapatnam-16, Vizianagaram-16, Warangal-25.